iMedia Brand Summit Jaipur 2018 is one of iMedia’s series of digital marketing & social media events around the world, such as iMedia Brand Summit in USA, Japan, New Zealand, iMedia Online Retail Summit: Australia and iMedia Commerce Summit Japan. It is a three-day event that gathering the best speakers, innovative business leaders, solution providers, and publishers, in addition, a great set of valuable sessions, workshops, and presentations & talks. 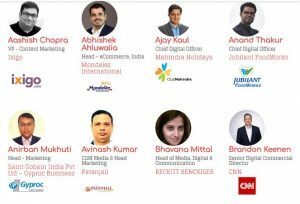 iMedia Brand Summit Jaipur 2018 will take place from 29 – 31 of August 2018 at JW Marriott Jaipur Resort & Spa, India. iMedia is the most influential community of senior marketers in a rapidly evolving digital world. Learn the latest in the Automation and content marketing industry. Meet the best industry’s senior brand and agency marketers and Speakers. Get a help to take your business to the next level. Follow up the iMedia Brand Summit Jaipur 2018 updates here OR discover more Digital Marketing events, conferences & webinars in India during 2018 here.